The story of Spacewar! continues: In this episode we're leaving Steve Russell & Company and are going to investigate some of the hacks and patches for Spacewar! 4. Even after the original authors had left Spacewar! as of version 3.1 as the apparent final version, others came up to step in their place, polishing the code and adding features to the game (most prominently Diamantis Drakos “Monty” Preonas, adding the advanced, high-precision gravity computations of version 4 and adapting the game for the automatic hardware multiply/divide option; see Part 6). Albert W. Kuhfeld even recalls "a couple of [MIT-]students trying to introduce a computer-piloted flying saucer to occasionally zoom through the game as a kind of “wild variable.” To the best of my knowledge, they never got it working." (Kuhfeld, Albert W., "Spacewar"; in Analog, July 1971 issue; p. 79) While this Asteroids-like feature was never to be seen seen in the wild, persumingly failing on predicting the trajectories under the influence of gravity and due to the limits of available real time resources, there's still a number of features to explore that were actually accomplished — and at least some of them are remarkable hacks deserving our most ungrudging attention. Artist's impression of the scoring experience in Spacewar! 4.8 patched. Slug [Steve Russell; N.L.] tells me that there is a Lost Version of Spacewar! There would be, of course. He says the game is pretty much like the original, but the scoring is much more impressive. After each game of a match, cumulative scores are displayed as rows of ships, like a World War II fighter pilot's tally. Slug says he saw this version for a short time on the PDP-1, but never found out who produced it or what became of it. By now, we're happy to say that the mystery is solved and the version in question is neither lost, being the scorer patch for Spacewar! 4.8. And it even found some further approval by Spacewar's original authors by it being added by Peter Samson in 2005 to the code of Spacewar! 4.1f, the version apparently running on the Computer History Museum's restored PDP-1. BTW: ▶ You may play Spacewar! here, too (original code running in an online emulation, v. 4.1f preselected). The game was essentially complete by the end of April, 1962. The only further immediate work was to make Spacewar! presentable for MIT's annual Science Open House in May. A scoring facility was added so that finite matches could be played, making it easier to limit the time any one person spent at the controls. To provide for the crowds that we (accurately) anticipated, a large screen laboratory CRT was attached to the computer to function as a slave display. Perched on top of a high cabinet, it allowed a roomful of people to watch in relative comfort. Persumingly, this (now lost) scorer patch would have patch the auto-restart patch (see the last episode) — just like the latter did to the hyperspace patch —, since the auto-restart patch would already detect the end of a game, by this providing an ideal hook for the scorer. We may expect this first scorer to have been similar, both in code and experience, to the scoring device that we've already explored in Part 3: In Spacewar! 3.1 (and ever thereafter), on the end of a match of a preselected number of games or on the test word switch for bit 12 being deployed at the end of any individual game, the scores of the two players are loaded into the accumulator (AC) and the In-Out register (IO) respectively and the machine would grind to halt (hlt), thus displaying the scores in binary at the console lights. Scores displayed at the console lights of the DEC PDP-1. 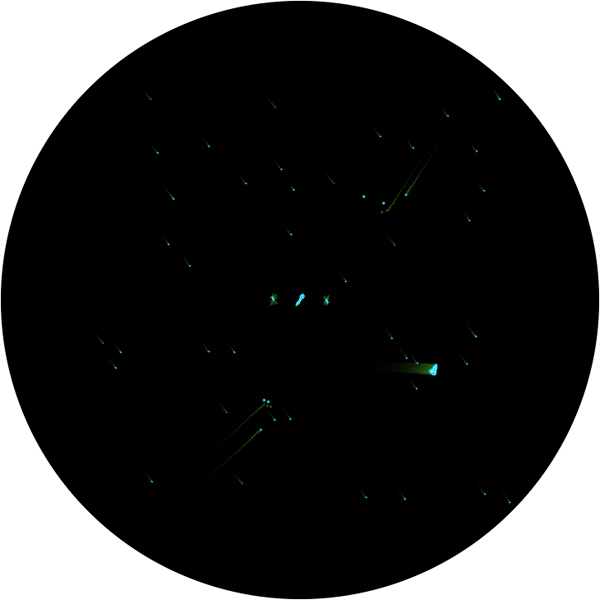 Player one (accumulator, 4th row from top): 18, player two (IO register, below): 3. Score display of the Spacewar! 4.8 scorer patch (Emulation). Player one (Needle): 18, player two (Wedge): 3; a big ship accounts for ten scores. And here is closeup of the score display (emulated display resolution: 1048 × 1048). — Mind the dotted appearance of the bigger spaceships. Spacewar! was conceived in 1961 by Martin Graetz, Stephen Russell, and Wayne Wiitanen. It was first realized on the PDP-1 in 1962 by Stephen Russell, Peter Samson, Dan Edwards, and Martin Graetz, together with Alan Kotok, Steve Piner, and Robert A Saunders. Spacewar! is in the public domain, but this credit paragraph must accompany all distributed versions of the program. Spacewar! 4 and it's dedicated patches include code by Monty Preonas ("ddp"), "dfw" (real name unknown), and, maybe, other anonymous authors. Update: Please mind that while the patch is described as being by an "anonymous author" in the following section, there is now a confirmed author, Peter Samson, compare the note below. The source code of the scorer patch is to be found at archive.org and at bitsavers.org and seems to be rather a typoscript than an actual listing, since it includes a few typos. Here is a corrected, runable version. sce,	sad scm		/ already set up ? szf 6		/ which outline ? isp t1		/line done ? sas t2		/ return ? Apparently missing is a definition of the symbols which are inherited by the main program, like sx1, sx2, ssn, ssm, etc. Please mind that some labels are rather defined as variables in the main program, like \sx1, \sx2, \ssn, \ssm, and so on. The Macro assmbler requires a signifying markup for a variable only once in the entire source, therefor, when included in the same run, both notations are synonymous. In order to enhance readability, we will further ignore these minor differences in symbol notation. The last few lines are rather a hint to where to include the data of the background star field, modifying the normal start address of 6077. So, where to begin, if not with the patched addresses? Anyway, the last instruction, "jmp a3 3", jumps to the third instruction after label a3 ("xct tno"), resuming the normal flow by setting up the initial supply of torpedoes for each of the ships. At the end of this snippet, the value corresponding to the instruction "jmp scc 1" (jump to the location scc + 1) is loaded as a constant into the accumulator and then stored in the two locations, we've just computed before. What on earth — no, when arriving at this piece of code, we're actually in space or even burning in the sun; so: Heavens! — what's ging on? Since the two locations in t1 and t2 are deep inside the compiled code, we are obviously patching the code generated by the outline compiler by a jump instruction! The outline compiler, probably one of the first JIT-compilers ever, generates a giant unroled loop by transforming individual outline codes to movements and display instructions by the means of a dispatch table. The display codes (0...7) are any of five move-and-display commands (down, left, right, down & left, down & right), a command toggling between storing the current location or setting it to the stored value (as required for drawing fins), and, finally, code 7, which, at first encounter, resets the outline to its very start position to start over with a (horizontally) mirrored outline, or, on second encounter, finishes and causes the code to jump back to the main program. Since we're close to the end of the generated code, this might well be related to code 7. -21    szf 5		// program flag 5 set? Counting up 17 instructions (octal: 21) from the instruction following the last one, we actually end up at the jump to the main program, as in "jmp sq6", which will be executed during the second run through the generated code. (Program flag 5 is set in the very first instruction of the compiled outline code, therefor, at the end of this snippet, the code starts over at the second instruction.) So, this is the instruction that will be patched by "jmp scc 1" and label scc happens to be within the scorer patch itself, thus rerouting the outline compiler to the display loop. What a hack, and what a monument to the Space Program! Well done, anonymous hacker! And, to return once more to the notion of the source code as a text, we may add, this is not so much making a statement on the expressive level, but rather by how it does its thing. This is a statement in the sense of the true hacker spirit at its very best! The two variables ssn and ssm are containing both a scaled sine for the use of the outline compiler in order to advance the outline. Both values are now set to zero. The instruction "jsp i cwg" and "dio t2" do the other things, namely fetching the current state of the control input and storing it in t2, which happens to be repurposed from the main program again. This snippet initializes the score display of spaceship 1: First, we clear program flag 6 ("clf 6") and load the start of the generated outline routine into AC, just to store it in the address part of the instruction labeled scc. Then we load the constant 240000 (octal) into IO and setup the value of the score of spaceship 1 plus 1 (1sc + 1) in AC. At label scb we complement the value in AC, obviously for later use to control a loop by a count-up, and store this in location t1. Then, we store the contents of IO (the constant 240000) in sy1, load the constant 540000 into AC and store it in the location sx1. Both sx1 and sy1 are defined in the main program and happen to contain the display location for use by the outline code. Thus, we've set up a display location at (540000, 240000), or rather, since 540000 is in one's compliment -237777, at (-237777, 240000). Since only the 10 highest bits are of any significance for a display instruction, this will actually cause a spaceship to be drawn at the screen coordinate (-477, 500), or decimal (-319, 320) on a screen with a coordinates system streching horizontally from -512 to +512 and vertically from +512 to -512 from its origin in the center. Therefor the spaceship will be drawn with its top center at the upper left third of the upper left quadrant. By a shift by 3 bits to the right, we divide 540000 by 8 (now 54000) and store it as the horizontal off set in stx (in screen locations 130 or decimal 88). Then, we load the value 3000 for the spaceship's size in scm (scaled sine for movements by the outline code; in screen locations: 6) and jump for further preparations to label scg. Here, the value in AC (still 3000) is stored in scm, ssd, scn, csm and parameter csn is finally set to the complemented value (inverted offset). With the movement parameters for the outline code all set up, we're ready to prepare the display itself: We may recall that the outline code is waiting for the display's completion pulse, so we'll have to provide one in advance or the code will wait for ever. For this we're setting up a display location at the very top of the spaceship's outline by loading stx and sty into AC and IO respectively and issue a display command. The instruction dpy-4000 does not only request a completion pulse from the display, but also instructs the the display to operate at brightness 7 by adding 700 to its instruction code. Since the intensity values are in fact a 4-bit one's complement, this is the dimmest possible intensity of -3, invisible to the human eye — perfectly suiting our purpose. We've seen label scc before, when we stored the address of the outline code in question (here: spaceship 1) in it's address part. This will be now executed and the patched jump (scc 1) in the outline code will bring us back at the next instruction. — Please mind that, since the unit vectors / scaling factors are set to 6, the outline will happen to advance by 6 display locations at each step and the outline for the very first ship will be drawn 6 times as big as usual, also causing the dotted appearance of the player's spaceship that may be perceived in the closeup. — The value in sx1 is set by the outline code and is the last used display location (x-position). To this we add our previously calculated offset in stx and store it back again. Thus, we're ready for any next ship that we might have to display. But, are there any? sas t2		/ return ? // not the same as before? szf 6 		/ no, do another line? The instruction "isp t1" increments the loop counter in t1 and skips the next instruction, if it would be zero or positive. (Since we're drawing the player's ship by the same device, we were adding 1 to the score in the initialization before.) If the score is zero, or if we did draw some before and have arrived at the last one, we'll skip the next instruction that would bring us to the code for drawing the actual score at label scd. If already done, we'll continue at instruction "jsp i cwg" and fetch a new control input into IO. The instruction "lai" is peculiar to a PDP-1 with upgraded hardware, like the one at MIT in 1963 and later, or a PDP-1D. While not a standard one, it is quite a simple one and copies the contents of the IO register into the accumulator. (Without the upgrade, we could have achieved the same with our well known macro "swap".) With the current control word in AC, we may now compare it to the one we stored on entering the scorer patch, as in instruction "sas t2" (skip next instruction, if AC does not equal the contents of the address). Should we detect a change, we'll leave the scorer patch and jump back to the main loop. The target of the jump, address a4 + 3, is the very next instruction after our patched jump instruction in the main program, the one that brought us initially to the scorer. If still in business, we check program flag 6 ("szf 6"). If zero, we skip the next instruction and continue with spaceship 2, else we start over with a jump to label s1, the setup for spaceship 1 that we've already seen above. In case we would end here, there's still the updated value of the loop counter (score + 1, complemented) in AC, left there by the isp instruction. To this we now add (octal) 11 (decimal 9) to check, if there would be at least (decimal) 10 left. If the result is still negative, we'll skip the next instruction. If positive, we'll jump to label sch to draw the appropriate number of small ships for the individual scoring points. If we're still in business, there are at least 10 ships and we're going to draw a double sized one to indicate a decade. To do so, we've to reposition our drawing position on the screen. Since the outline code draws from the top-center down and leaves the last coordinates (bottom-center) in sx1 and sy1, and further, because we would want to have all the ships neatly aligned to the baseline, we have to add the height of the ship to the baseline (in sy1). Since the ships are of different height, we'll have to check program flag 6 for the type of ship to draw and load the according amount (30000 for a wedge or 36000 for a needle). To this we now add the contents of sy1 and store the result back again. To provide a suitable horizontal gapping we load the constant 40000 and store it in stx. Finally, we load the constant 1000 (for a distance of 2 sceen locations) into AC and go for the actual drawing code. The code is quite analogous to the one we've just seen. To make a difference, we first set up the horizontal gap (30000) and then decide on the vertical offset from the baseline depending on the kind of ship to be drawn (14000 for a wedge, 17000 for a needle). As above, we add to this sy1 and store the result back again. Finally, law 400 sets the scaling factor, this time 400 for an advance by a single screen location (normal size). First, we set program flag 6, in order to indicate that we're drawing the score of player two. Therefor, we load the start address for the outline of the wedge (in property "not 1") into AC and store it in the address part of the call at label scc. Then we load the new vertical display location 730000 as a constant into IO. (Again, 730000 is a one's complement representing a value of-47777, a display location of octal -117 or decimal 79.) Next, we prepare the value for the loop counter (score 2sc plus 1) in AC and are off for further setup procedures at label scb, the one we've seen bevore (right after the setup for spaceship 1 at label s1). Did we miss anything? An attentive reader may have observed that the jump instruction so heroicly patched in the compiled outline code is never restored. Wouldn't this break anything? — Not at all, because the JIT comiler is run at the start of each game and the generated outline code is simply written anew. That's all folks, at least on the 4.8 scorer patch! Time for a break. The anonymous author of the 4.8 scorer patch isn't anonymous any more, it is no one less than Peter Samson, whom we met already in Part 1 where we were exploring the Expensive Planetarium (background display). Also, Peter Samson may be recognized as the personification of the MIT-hacker tradition and as the author of the original TMRC Dictionary (first edition 1959) that was to become the well known Jargon File. Adapted for automatic hardware multiply/divide, new high-precision gravity computations, minor code optimizations. Sun drawn as dotted line (uses half the instructions), major code reorganizations, rewrite of instruction count / frame stabilization code, instruction count increased from 4000 to 5000 per frame in order to adjust the frame rate/speed for harware arithmetics. Like Spacewar 4.0 ddp, simplified starfield with stars of 4th magnitude stripped. Minor differences in hyperspace code (angular momentum is set to random value additionally). "TS" and the date suggest a relation to time sharing, even, if there is not hint in the code. No visible differences to Spacewar! 4.1 dfw. Same as 4.2 ddp, Twin-Star mode (accessible via sense switch 2). Spacewar 4.4 ddp (May 17, 1963 / May 21, 1963), probably by Joe Morris, date and signature unmodified as in 4.3 ddp. Iteration of 4.3 ddp, attempts to produce an dual screen ego shooter (a few issues here), some optimizations for upgraded PDP-1 (new instructions like swp), some input parsing code stripped. Spacewar 4.1 dfw as of July 26, 1963 updated by Peter Samson (prs) for the use of the CHM to include the scorer patch, as well as other minor adjustments: "spacewar 4.1 mod for CHM, 2005-06-01 - 2005-11-28, changed delay in score display, 2008-08-22 -- prs"
Intensities of background display were apparently adjusted for use with the restored Type 30 CRT. Spacewar 4.2a dfw (? ): sw4.2.bin, see also spacewar4.2a_sa4.bin (binary tapes image only). UPDATE: According to newer informations provided by Dan Edwards these "surplus controllers" originated rather from a Bomarc missile control console: "[O]ther consoles being […] the right arm panel of a military surplus Bomarc missile control console which featured [a] professing joy stick. That console looked fancy, had nice directional micro switches plus a button on the top of the joystick which was used [to] fire the 'photon torpedoes' in the game. In the end, this console wasn't used much because it was too big and bulky." Spacewar to support these controllers made it into the "standard"
version, but it was fun writing them. / rotate cw, rotate ccw, fire torpedo, and hyperspace. While Spacewar 4.8 actually supports only a single rate of acceleration, there had been, apparently, at least one version with high and normal acceleration. MIT, advanced control box attached to the PDP-1 (but there are still two of them). 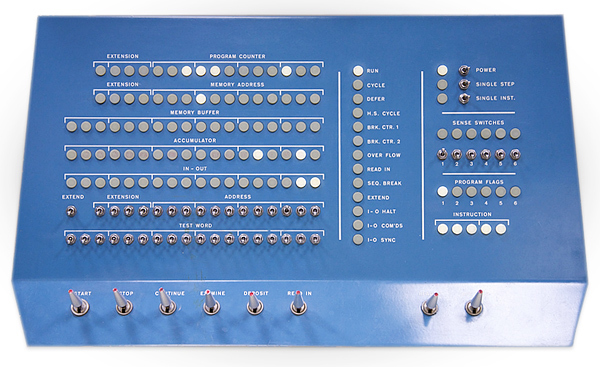 Image courtesy of the Computer History Museum (CHM), Catalog No 102631249. 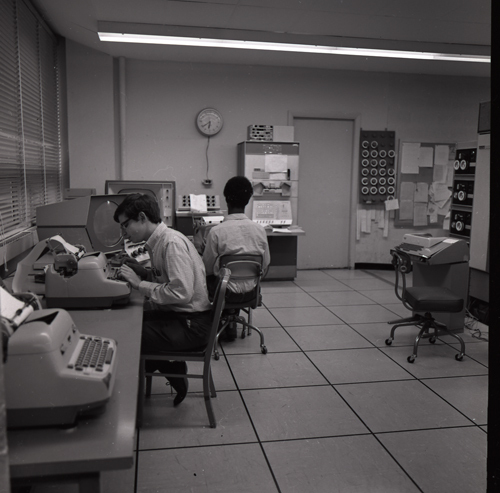 And here is another aspect of the situation, showing the PDP-1 and what looks like a rack of DECtapes in the background (DECtapes were introduced in spring 1963). A contact print proves both pictures to be shot on the same film. MIT, PDP-1 with advanced control boxes. Image courtesy of the Computer History Museum (CHM), Catalog No 102631246. Note: There's an aditional CRT of non-DEC make in the left corner near the PDP-1's console. This could well be the scope that was hooked up as a secondary, public display for the MIT Science Open House in May 1962. — "To provide for the crowds that we (accurately) anticipated, a large screen laboratory CRT was attached to the computer to function as a slave display. Perched on top of a high cabinet, it allowed a roomful of people to watch in relative comfort." (J.M. Graetz, "The Origin of Spacewar"; in Creative Computing, August 1981 issue; p. 66) . — Thanks to this image we may comprehend the scene quite well. As we've seen the wonders of the 4.8 scorer patch, we had no idea that this would not have been the only score display. But there is a similar one, and since it is included in versions 4.2 – 4.4 of the ddp-strain, it is apparently even older. Score display of Spacewar! 4.3 ddp (Emulation). 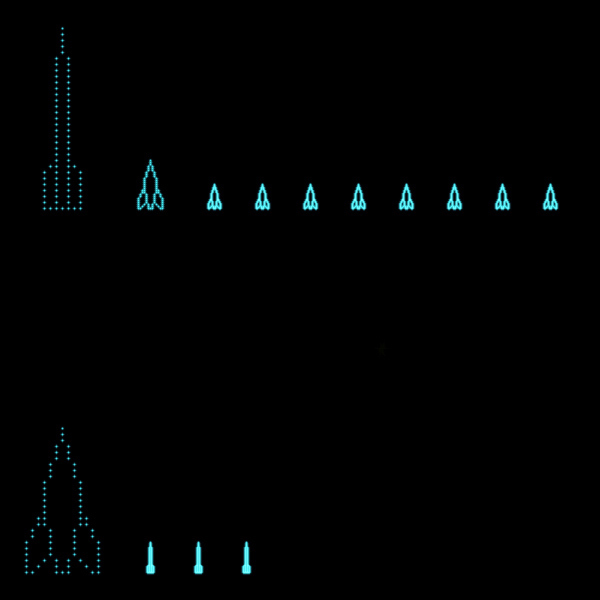 As we may observe, there are some visual similarities between the display of the 4.8 scorer patch (compare this screenshot) and the score display of Spacewar 4.2–4.4 (ddp): Both of them are displaying a big player's spaceship iconicly at the left with their respective tally to the right, and both of them use a bigger spaceship to indicate a decade. But there are differences, too, in position, alignment, and spacing, and, most notably, there is a pulsing separator line, drawn by a tiny segment that is moving unremittingly from left to right like a 1980s-TV-series scanning sensor. Let's have a look at the code — in order to save some space, we'll include any annotations inlined. We may observe that the same symbols are used here, which is also true for some of the main part of the score display. The code in question is placed near the end of the program, after the inclusion of constants and variables, and after the space reserved for any patches (octal 100 locations), but before the final label for the start of the objects table. We'll follow this top down, just as we find it in the source. Still the same as in the 4.8 scorer patch, but different symbols are used for temporal storage. sza		// result in AC zero? So, we have just drawn a big ship, either at (260000, 230000) or at (260000, -15000) (for screen locations divide by 8). Moreover, our code will return at fub, which is also the very next instruction. The first few instructions are easy, since this is simply flipping the state of flag 3 and therby the spaceship that is to be drawn. The next instructions may need some explanation. The instruction "iot 111" ist still an enigma. It somehow seems to preserve the state of the last control input (as read by "iot 11"), but seems to complement it or add some other transformation. However, we may detect any changes by adding the readings of "iot 11" and "iot 111". By adding an initial bit-offset, we're able to isolate distinctive bits. There's a normal exit condition and even a restart condition. If we detect either, we setup the according return address in the address part of location fiu. Otherwise, we continue with the next spaceship/player at label fis. This is a tiny loop for a delay depending on the value of the return address in AC. When done, we finally make the jump to the return address in fiu (back to main loop or restart). And this was the 4.2 score display. So, what other hidden feature are we talking about, to be found in versions 4.3 (5/17/63 ddp)? First of all, "Twin-Star Mode" is not an official name by any means, it's just my own way of referring to it by its most prominent feature, but we could call it "Needle Mode" with some justification as well. I haven't found a reference to it of any kind, but, if you assemble the sources of Spacewar 4.3 (ddp) and happen to deploy sense switch #2 (normally activating low gravity), there is undoubtedly this peculiar phenomenon to perceived on the screen. both sides of the Needle, torpedoes and exhaust blasts are drawn in tranposed screen locations. ▶ Play Spacewar! 4.3 in Twin-Star Mode (online emulation, v. 4.3 ddp & sense switch 2 on preselected). On first encounter it's hard to comprehend what's going on: The Needle (spaceship 1) is pinned to the center, facing downwards, the Wedge (spaceship 2) is placed at the lower left corner, slowly falling into the center, where there is not a central star, but two of them to both sides of the Needle, and the background stars — are moving! On closer inspections, we'll find that the Needle is always fixed to center: It will, turn, but it will not move. What moves, instead, is the universe! If the Needle thrusts, it pushes the whole universe rather than moving itself on the screen. Thus the movement of the background stars, initially accelerating as the Needle is pulled by the gravitational field. The entire scene, but the central star(s), is plotted relatively to the Needle, like an ego view on a radar sceen in the Needle's cockpit. (Since the Type 30 CRT actually utilizes a tube which was originally developed for radar scopes, it won't become any more realistic than that.) If the Needle swerves, it will stay fixed, instead the universe will swerve in the opposite direction. But this translation of the screen coordinates is nowhere where it stops: If we happen to fire the rocket engines, the exhaust trails won't show up behind the spaceship. Again, it's not an easy one figuring out what's happening, but the exhausts are apparently revealing the true position of a ship (on further inspection they prove to be translated by some amount to the left and to the top). Same applies to any torpedoes on the screen. However, regardless to where a torpedo may be drawn, any explosions are displayed at the relative location of the respective ship. — Amidst all this cofusion, the hidden location of the gravitational center is soon to be lost, becoming an invisible, enagmatically moving pool of distortion in the spacetime continuum. And, most amazingly, when peeking inside the code, we'll find that it's just the usual game, with some minor transpositions added to the display layer. Note: Maybe this would all make more sense, if this were a true ego view from the position of the Needle and the different mode of displacement to be observed for the exhausts and the torpedoes would happen to be a bug or an unfinished feature. We may find out on closer inspection of the source. We had already a first look at how the twin stars were drawn in Part 2, but we really need to have a look at all the modifications (as compared to Spacewar! 4.2 ddp) in order to properly understand and to document this feature. This time we're dealing with what is merely a collection of membra disiecta, spread all over the source in tiny bits. Anyway, this is what might be found in Spacewar! 4.3 5/17/63 ddp as related to this feature, based on a diff to version 4.2 5/11/63 ddp. As mentioned previously, the game's logic, the internal coordinates, hit-detection, etc, remain the same as usual, only the display layer is concerned. It's just a view, and we may actually switch between views by operating sense switch 2. Now, dispt is a macro used to display a single dot on the screen, where parameter A is an argument to the display command (like "i" for not to wait for a completion pulse) and parameter B is an intensity (0..7). The y-coordinate for the display intruction dpi is provided by the parameter Y, while the x-coordinate is expected in AC as we enter the macro. Since this is called by a jda instruction, the contents of AC will be placed at label kcb and the execution will start with the next instruction, now with the return address in AC. As usual, we store the return address first, here in the address part of location kc1. The inclusion of the macro swap exchanges the contents of IO and AC (by two "rcl 9s" instructions). What's now in AC is the y-coordinate for the display instruction. From this we subtract the contents of location ny1, the y-position of spaceship 1 (compare Part 3). Another swap puts the result back into IO again and "lac kcb" brings the x-coordinate into AC. From this we now subtract the x-position of the spaceship as stored in nx1 and the final jump to the return address brings us back to where we left before, but now with translated coordinates in AC and IO. 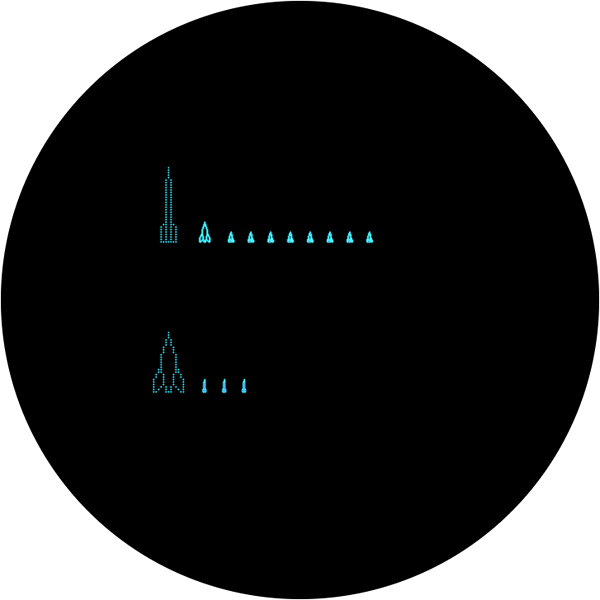 The effect is as simple as impressive: Would we want to display a blip at the position of spaceship 1, the dot would be displayed at the center as both resulting coordinates must be zero. Any other location will be displayed by it's relative offset to spaceship 1. At label fyn w load the y-coordinate into IO and are ready to display it by the dpy instruction at the end of the snippet. If sense switch 2 would be deployed, the call of kcb translates the star relative to the position of spaceship 1. The first two inclusions of the macro scale are storing the scaled unit vectors (sine, cosine) for use with the compiled outline code. (In Spacewar! 3.1 theses instructions were labeled sp1 and sp2, compare Part 5.) "lac i mx1" loads the x position of the current object into AC for further processing, namely subtracting the scaled sine (\ssn) from it and storing it in \sx1, a position ahead of the center of the ship, where the outline will start to draw, and after subtracting \ssn a second time, we store the result in \stx, a position just in front of the spaceship, where any newly fired torpedoes will appear. The second part after the break is doing just the same for the y-properties. The first of the two newly added line is skipping the next one, if sense switch 2 would be zero. If set, we subtract the position of spaceship 1 from the coordinate in question. — As for the ships, the new code isn't altering any positional values, but just affects the coordinates stored in (\sx1, sy1) where the vessels will be drawn, when the outline code is called. szs 20		// new: twin-star mode? The jump instruction at label mot (or sp5) does the thing, calling the outline routine of the current object (stored as a pointer in the address part of the instruction). Since the outline code is waiting for a completion pules, we have to provide one beforehand, normally in the center of the screen by clearing AC and IO and issuing a "dpy-4000" display instruction. For the same reason we fetch the last completion pulse by the final ioh instruction. The macro dispt is doing the same for all dots individually drawn, as for displaying a torpedo, showing the heralding spot at the breakout of hyperspace, or the drawing dots which make the exhaust blast. By this, every display instruction in the game becomes a subject of our displacement treatment. Drawing algorithm for the heavy star, normal and Twin-Star mode. szf i 20		// new in sw 4.3: sense switch 2 set? The first instruction clears AC, IO, and program flag 6 (used to control the two passes). Since all these instructions are micro-programmed and in the same operation group, we may combine them in a single one. The next instruction is the first of the newly added ones: If sense switch 2 is set (not zero), we'll skip the next instruction, which sends the flow to a preliminary display instruction at "bjm-1". Here we request, once again, a completion pulse required by the actual drawing code, which is finally entered by the jump at label bjm. If in Twin-Star mode, we subtract the contents of ny1 and nx1 as usual. Closeup of the twin stars in Spacewar! 4.3 (Emulation). Obviously ny1 is zero at this time, since there is no vertical offset to be perceived, and nx1 must produce a constant offset over all the frames, because the position of the stars isn't moving at all. How comes? First, nx1 and ny1 are not some pointers related to the current object, but two symbols for the absolute address of the positional properties of the first of the moving objects (spaceship 1). If the position is not lost between frames, these locations really should contain the according values. — Awkward, really embarrassing, in deed. That's awkward, indeed, since we find nx1 to be translated to location 30 (octal) and ny1 to transcribe to 60 (octal), while the two symbols are producing the addresses 3466 and 3516 respectively anywhere else in the code! — So, this is actually a bug! So, on first pass, when the assembler encounters the pseudo instruction defining nx1, symbol mtb is still unknown and per definition minus zero, resulting in a value of 30 for nx1. Since ny1 is derived by nx1, it will inherit the error. Only as we encouter this definition at the second pass, the true value will be known, resulting in the correct address being used for the two symbols ever thereafter. Since the code for drawing the gravitational star happens to be located before these definitions, both symbols will be still as of after pass 1, causing the bug. Twin-Stars fixed. (Emulation) — Mind the movement trails left by the two parts of the heavy star. So, what happened to the exhausts and the torpedoes? They are drawn by the macro dispt and are therfore receiving the same transposing treatment like the rest of the display commands. Turns out, they receive the treatment twice. As for the exhaust blasts — as we may recall from previous episodes (and have even seen near the top of this one) — the outline code sets the variables \sx1 and \sy1 to the very last screen location at the bottom center of the outline, the very spot, where the exhaust is drawn using the said variables. Since the outline is already drawn at a translated pair of coordinates, the second translation in dispt causes a duplication of the offset. The effect for the torpedoes is quite similar, while even more severe: At the begining of this section we've already seen how the coordinates for any torpedo would have been transposed together with the display coordinate of the spaceship. But the pair (\stx, \sty) isn't used for display purpose only, it's also the actual location of the torpedo assigned in memory. Therefore, the location of the torpedo already transposed will be translated once again by dispt, effecting in a doubled offset. But, even more, the torpedoe will be logically mapped by its initial offset to spaceship 1! Therefor spaceship 1 will be always firing from the center and spaceship 2 will be firing with an offset that is equal to the offset of spaceship 1 to the origin. The last issue with the code is a tiny screen artifact left by the modification of the code just before the call of the outline code, the transposition of the spot, where the first, preliminary blip is displayed in order to optain a completion pulse from the display. Normally, displayed at the origin, it mends with the central star. But here, obviously some kind of translation would be of help. By translating it by the usual offset, it is displayed where the first part of the heavy star would be drawn, if there wouldn't be the bug. So, as it is, it happens to be drawn at the same offset that both the echaust and torpedoes of spaceship 1 will have assigned to, by this disclosing the spaceships firing position on the screen. Judging from our inspection of the source code, a Needle's 2D ego mode was clearly what was intended first. (All modifications are apt to transposing each of the display commands there are in the program to a co-ordinates system relative to the Needle.) And this is an important fact, because this would be a major step towards the pseudo 3D ego shooter, something that we wouldn't see until a decade later. So, what would be necessary to fix this to produce a true Needle's ego view? 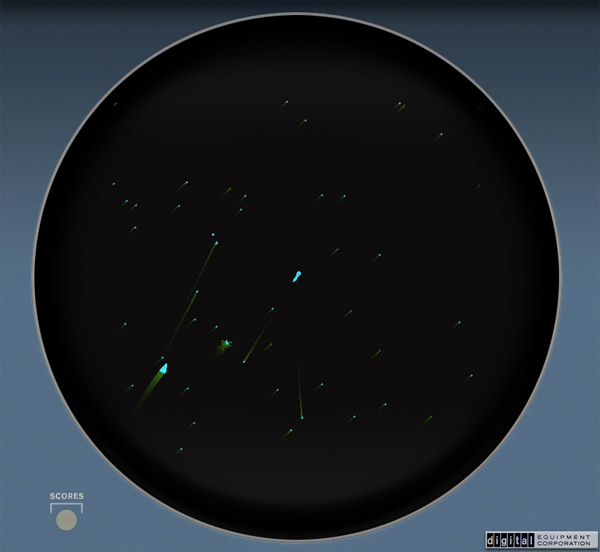 The joys of Ptolemaic space travel: Needle View in fixed Spacewar! 4.3f. Screenshot of emulation, N.L. 2015. ▶ Play Spacewar! 4.3f (fixed) Needle Mode (online emulation, v. 4.3f & sense switch 2 on preselected). The source code of this mod is available at https://www.masswerk.at/spacewar/sources/spacewar4_3f.txt. (The source contains the changes mentioned above. I've also switched the implementation of the Expensive Planetarium to the one of Spacewar! 3.1, just for personal liking.) It is left to the judgment of the observer, which version is to be prefered. We may conclude that the original Twin-Star Mode is certainly as entertaining as it is enigmatic — a perfect novelty. Edit: Please mind the continuation of this quest for a subject view, as it is found in Spacewar! 4.4, discussed in Part 10.
spi+spa i-skp	// punch mode? spi+sma i-skp	// punch mode and ready? What would be needed to record a game? The random seed and the stream of control inputs per user and frame. And what would we need to replay a game? The random seed, once again, and a stream of control inputs to be used instead of the readings of the actual input devices (control boxes or test word switches). That's exactly what is recorded and read by this patch, to and from the paper tape. Using this patch the game starts now at label go: If we're in read mode, we'll read the first 3 valid lines from the paper tape (6 bits per line) as a binary number (18 bits) and initialize the random number by this. The instruction "rpa-i" requests a read of the next character (alphabetical) from the paper tape (see below). If in punch mode, we first write a prespan of (octal) 200 empty lines. Next, we write the current state of the random number onto the tape. Read or write mode, we then jump to the normal start address at 4. While the game is running, any attempt to read a control input is caught by the trap installed at address 40 (label cwg). Since this will be called as a subroutine, we'll first store the return address. Then we check the status word by reading it into AC ("cks") and check the tape reader buffer status (in bit 1). The shift brings the paper tape status bit into sign position. If the sign bits in IO and AC are both unset, we're in punch mode and jump to cw1. Otherwise, we're in read mode: Since the last read instruction was an asynchronous one, we'll have the to fetch the input from the tape reader buffer into IO (rrb). Another "rpa-1" issues the next asynchronous read. Meanwhile, we transform the character format to the bit-patterns used in the game by a rotation by 4 bits to the right and return, thus supplied with the suitable control input, to the main program. If in punch mode, we first check for the paper tape punch being ready for the next command. If not, we redo at label cw2 with a new status check. If ready, we fetch the control input from the usual input routine at mg1. A rotation by 4 bits to the left converts the reading to a valid character, which is then punched onto the tape. Finally, the jump to cw3 restores the reading in IO and returns to the main program. 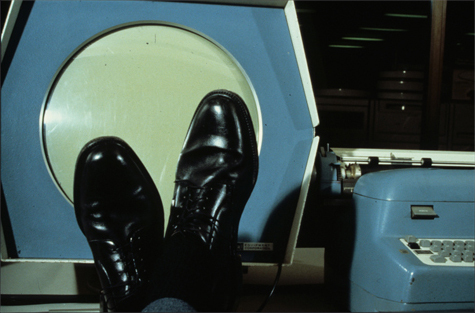 Laid-back, feet up in front of a DEC Type 30 CRT. 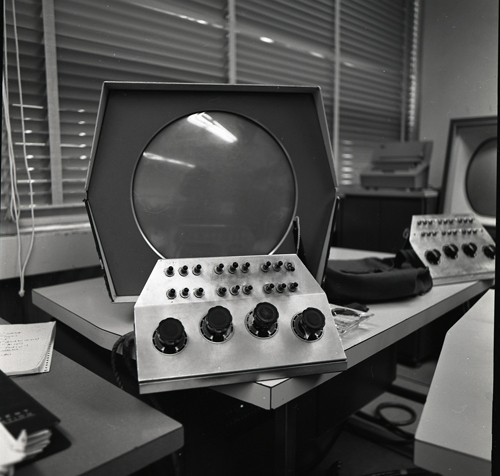 Image courtesy of the Computer History Museum (CHM), Catalog No 102631261. The following is a comparative timeline describing the parallel quest for orbit, both in manned space flight as conducted by NASA and on the PDP-1's scope. While NASA had certainly a head start, we dare say both programs achieved their primary goal quite on par (in February 1962), both programs reassuring the success in May and ending their respective missions a year later on the arrival of summer 1963. May 1961 May 5: FREEDOM 7 (Mercury-Redstone 3), Alan B. Shepard, Jr., first suborbital flight (15 min 28 sec). Steve Russell et al. imagine Skylark movies at the Hingham Institute. Probably first notion of a DEC PDP-1 to be donated to MIT. Jul. 1961 July 21: LIBERTY BELL 7 (Mercury-Redstone 4), Virgil I. Grissom, suborbital flight (15 min 37 sec). Summer 1961: The Hingham Institute Study Group On Space Warfare is formed, ideas on Spacewar! beginning to take shape. Nov. 1961 November 1: MR-1 (9) / Mercury-Scout 1, unmanned test flight, test of Mercury Scout launch configuration (43 sec). November 6, 10:00 a.m.: Official presentation of the PDP-1 at MIT, Department of Electrical Engi­neering (Room 26-260 – Campton Laboratories; coffee served afterwards in the Conference Room of the Research Laboratory of Engi­neering). Roughly the date of the Sine-Cosine-Incident ("All right, Russell, here's a sine-cosine routine; now what's your excuse?") — soon thereafter start of development. November 29: MA-5 (22) / Mercury-Atlas 5, Enos (chimpanzee), primate test of environmental control system in orbit (88 min 22 sec). About this time there would be first moving blips to be seen on the screen. Jan. 1962 — First playable version with moving objects drawn by an outline-interpreter. Dan Edwards adds gravity, the game is pushed out of limits of flicker-free display. 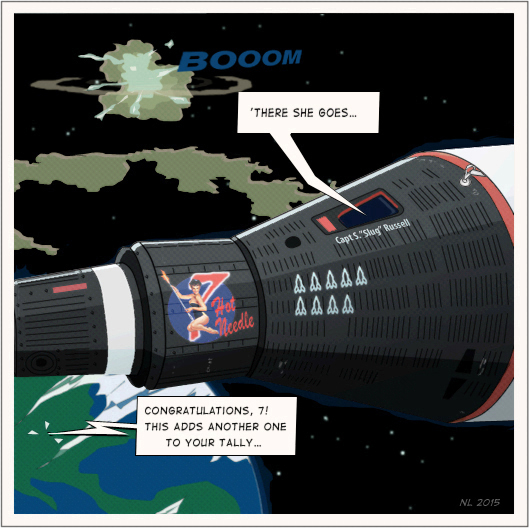 Feb. 1962 February 20: FRIENDSHIP 7 (Mercury-Atlas 6), John H. Glenn, Jr., first orbital flight (4 h 55 min 23 sec). Game basically operational. Outlines final. Control boxes are added. Mar. 1962 — Peter Samson adds the Expensive Planetarium for Spacewar 2b (March 13, 1962) replacing the original random starfield. Earliest known source of Spacewar 2b (March 25, 1962). Apr. 1962 — Spacewar 2b final (polarity of sense switches reversed, April 2, 1962), additional patches: auto-restart patch, hyperspace patch. Spacewar! is announced in the first issue of Decuscope. May 1962 May 24: AURORA 7 (Mercury-Atlas 7), Scott M. Carpenter, orbital flight, duplication of Mercury-Atlas 6 (4 h 56 min 5 sec). 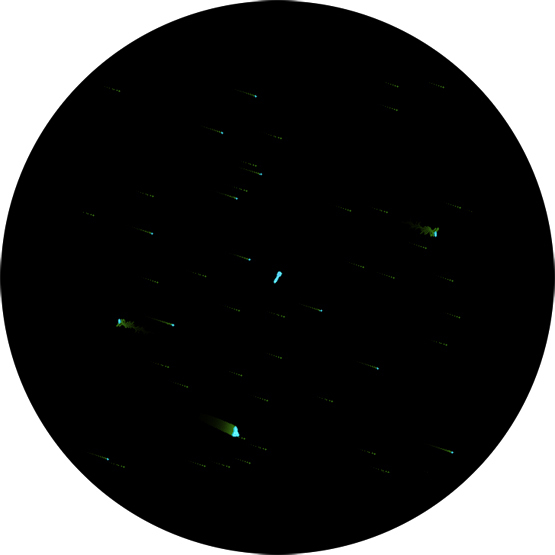 Final version of the hyperspace patch and the Minskytron signature (Hyperspace VIci, May 2, 1962), scorer patch added in rush towards the MIT Open Science House Day. Public demonstration of Spacewar! Martin Graetz presents a paper on Spacewar! at the first DECUS meeting in Bedford, MA, “SPACEWAR! Real-Time Capability of the PDP-1”. Sept. 1962 September 12: John F. Kennedy gives his Moon Speech at the Rice Stadium. Steve Russell returns to MIT to arrange Spacewar 3, incorporating the various patches into the game, hyperspace and explosions gain their final form, a parameter table is added for tweaking adjustments and allowing some variants (e.g., Winds of Space) by hacking these constants. Final version of original Spacewar!, Spacewar 3.1 (September 24, 1962). The original team drifts away. Feb. 1963 — Spacewar 4.0 by Diamantis Drakos “Monty” Preonas (February 2, 1963), update for automatic multiply-divide option, new gravity computations for best use of 18-bit precision. May 1963 May 15-16: FAITH 7 (Mercury-Atlas 9), Gordon Cooper, Jr., last Mercury mission, 22 orbits (34 h 19 min 49 sec). Spacewar 4.2 by Monty Preonas (ddp), May 11, 1963 introduces a first score display. Spacewar 4.3 by Monty Preonas (ddp), May 17, 1963 including a score display and Twin-Star Mode. Spacewar 4.4 for two displays by Monty Preonas (ddp), May 21, 1963, edited by Joe Morris (date unknown). Various models of control boxes and joysticks in use, parsing of control inputs gains in complexity. Jul. 1963 — Spacewar 4.8 by “dfw”, last known/preserved version of classic MIT-Spacewar! (July 24, 1963). Visual scorer patch (unsigned) by Peter Samson (prs). Russell, never one to "do something" when there was an alternative, begged off for one reason or another. One of the excuses for not doing it, Slug remembers, was "Oh, we don't have a sine-cosine routine and gee, I don't know how to write a sine-cosine routine..." Then Alan Kotok came back from a trip all the way to Maynard (DEC headquarters) with paper tapes saying "All right, Russell, here's a sine-cosine routine; now what's your excuse?" "Well," says Slug, "I looked around and I didn't find an excuse, so I had to settle down and do some figuring." I don't remember the exact order of things, but I'm pretty sure I started talking up a better demonstration program than the Minskytron, and eventually, Alan Kotok went up to Maynard and collected the sine and cosine routines from DECUS, presented them to me, and said, "Okay, here are the sine and cosine routines; now what's your excuse?" And I discovered I had run out of excuses; I had to actually think. And so I started work and figured out the basic trick of Spacewar! display which is that you only need to calculate a unit vector pointing in the direction of the spaceship. I kept talking this up and eventually Alan [Kotok] went out on an expedition to Maynard and came back with the sine and cosine routines and sort of plopped them down in front of me and said: "All right, Russell, here are the sine and cosine routines; now, what's your excuse?" So I actually had to sit down and do some thinking. And I wrote up a program that [had] two spaceships, but it didn't have any gravity and it didn't have any stars. And we played that for a while; it was kind of interesting. Please mind that this timeline is meant to be taken with some grano salis and that the dates of some of the MIT-progress (where not exactly given) and the respective chronological order are merely rough estimates. The full dates of any Spacewar!-programs as provided in this table are referring either to dates provided at the head of the respective source code or, in one case (Spacewar 2b April 2, 1962), to a date found at the label of a binary paper tape. Please mind that there were also some experimental features, like fuzzy torpedoes, that were not included in the final program and which have not found a place in this timeline. The total development time of the original Spacewar! is said to have amounted to a mythical man-month (200 h) distributed over a few months (please mind "Hyperspace VIci" in this context; not to speak of “testing” …). ◀ Previous: Part 8: Hyperspace! ▲ Back to the index.